Black beetle (Heteronychus arator) is a pest in the upper North Island, often on light, free draining soils, and on peat soils. Numbers vary widely from year to year, with root feeding larvae capable of severe summer pasture damage, and adults able to significantly damage establishing grass in autumn. Black beetles are only found in warm areas, including Northland, Northern Waikato, the coastal districts of Auckland, Bay of Plenty, Gisborne and northern Taranaki. As they live in and on the soil, they are mainly found in free draining, sandy, light ash or loam soils. The exception is peat soil, where they enjoy a good supply of soil organic matter as a food source. Adult beetles can damage autumn sown new pasture, particularly if it is direct drilled. They chew through the base of emerging ryegrass plants, just above ground level, killing them. This leads to patchy ryegrass establishment. 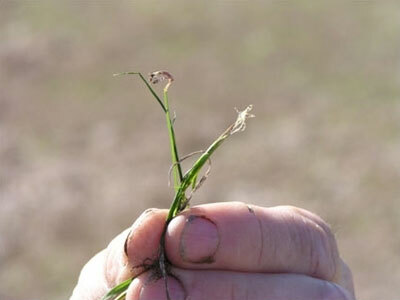 Larvae feed on plant roots during December - March and can cause patchy ryegrass death and plant pulling. Damage is most apparent in dry summers when larval numbers are above 40/m2. When sowing new pasture in affected areas always use insecticide treated seed. Using bare seed in the black beetle zone, the farmer runs the risk of complete ryegrass failure. 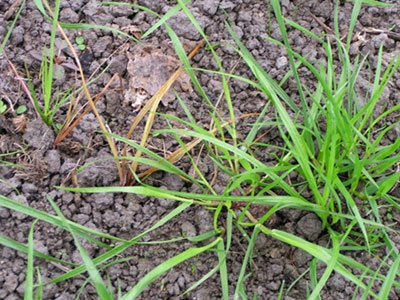 Sow ryegrass varieties with endophytes that ensure the new grass is more tolerant to black beetle, such as ryegrass with AR37 or NEA2 endophytes. Your local seed merchant should promote these practices.